More than 25 artists from national and international printshops agreed to participate in the project. Ashley built a CNC router and together, Tricia and Ashley created several sets of woodtype that spelled the word "touch". Each participant was given paper (donated by Legion Paper) and a set of letters (t, o, u, c, and h). Participants created a broadside edition that used the woodtype. While in Philadelphia, I picked up my paper and type directly from Tricia. I will admit that when I brought the package back to my studio in Aurora, it sat unopened for at least two weeks. I had absolutely no idea what I was going to make, so I procrastinated. Starting to work seemed to be the only way I was going to figure what to make, finally I opened the box. 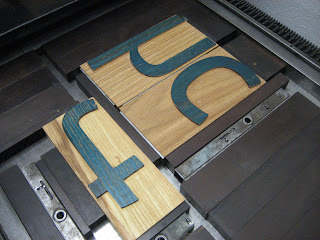 The wood type that was sent to me was really quite different from traditional woodtype. 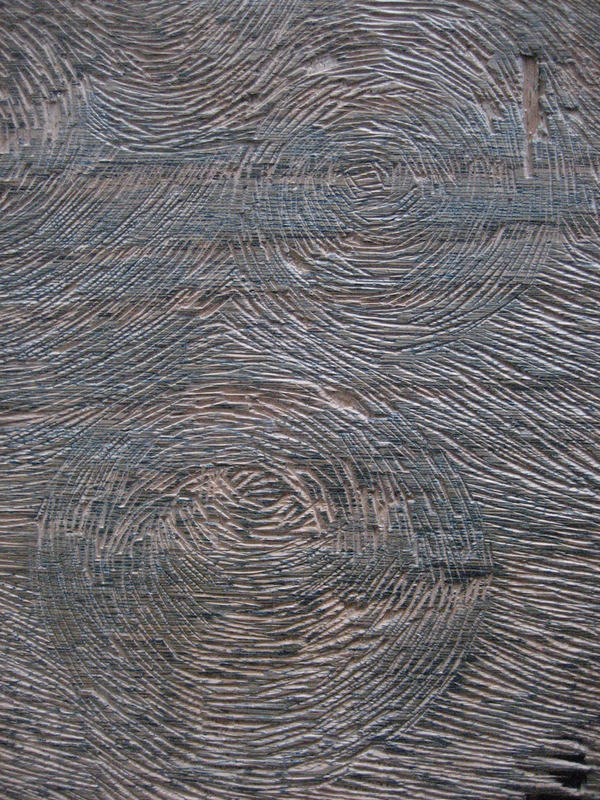 It was cut along the grain with no attempt made to hide the texture of the wood. 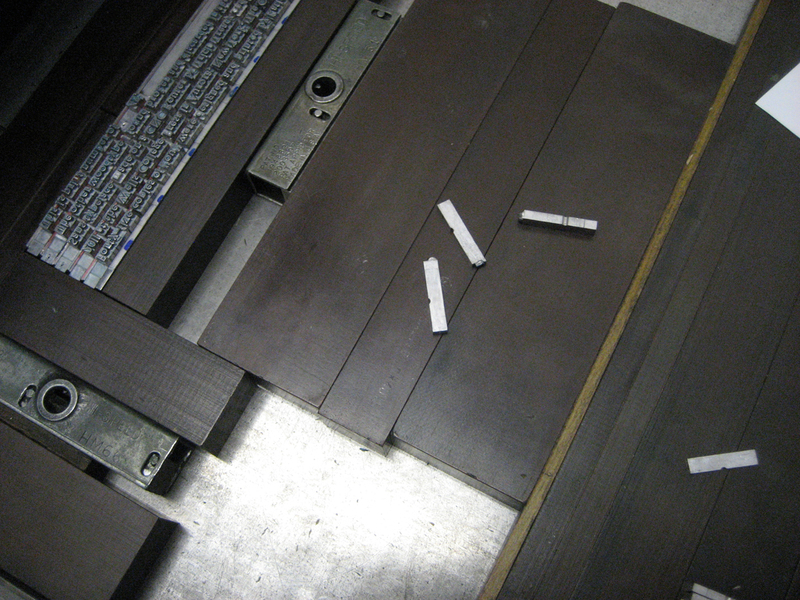 I gathered up the stack of older broken type that I had been collecting from the basement of the BAC. I felt there was an obvious connection between the old broken type and the newly made type. 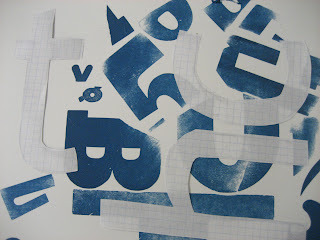 I started by laying out the fragments of letters along side the newly created letters, brainstorming...waiting to see if there was something I liked. Waiting for an idea. I arrived a concept of the O and the U pouring water into a sea of letters. 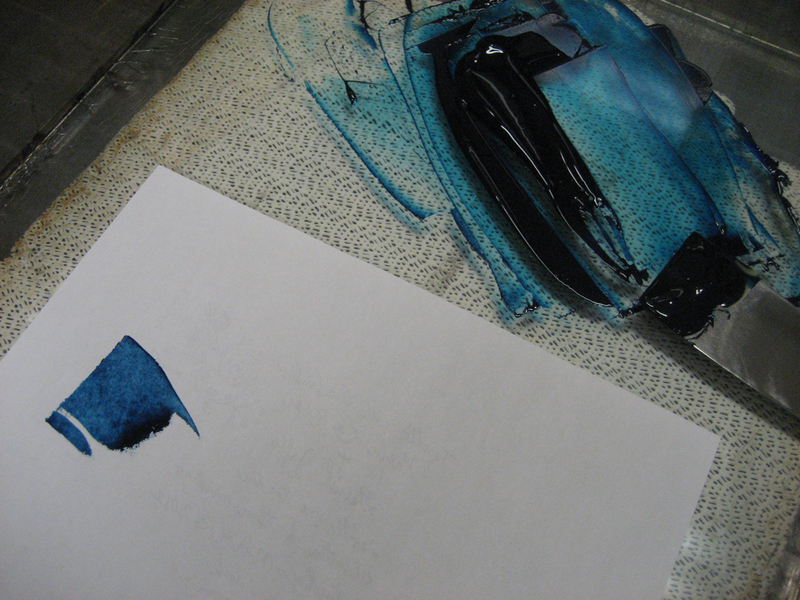 I began by printing multiple layers of type in blue to create the sea. Cut paper patterns were used to place on top of the printed areas. This helped me visualize where I would place things when printing new layers. 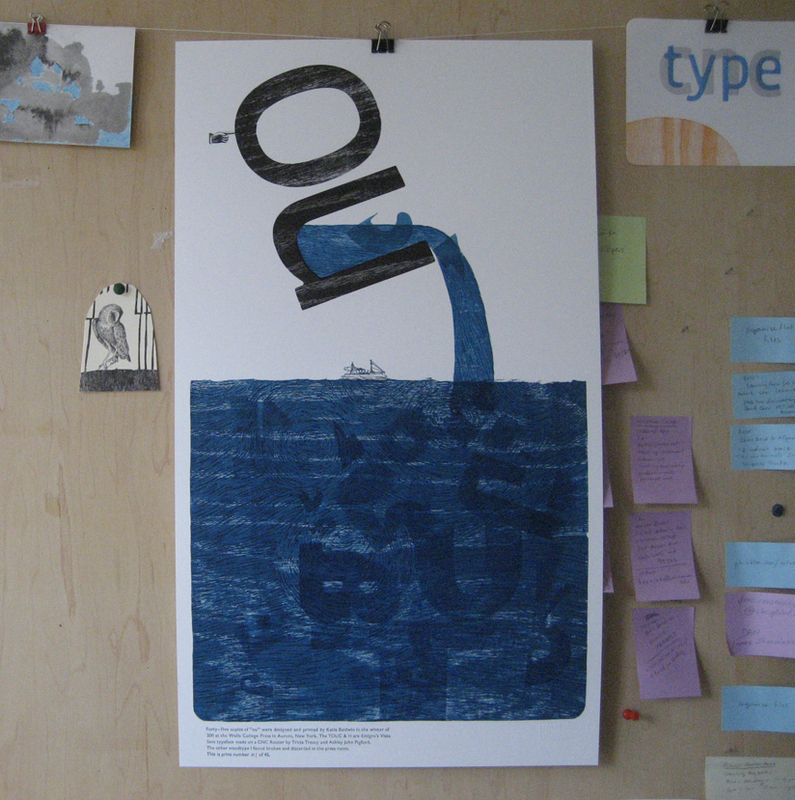 The layered printed type wasn't enough to create the feeling of a sea. It was clear that I couldn't rely on the type alone to create the image. I decided to use woodcuts as another element in the print. 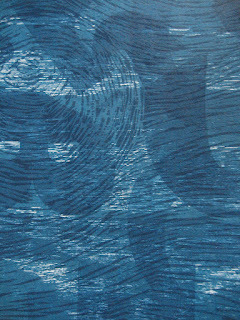 I have done a lot of woodblock printing, and often use a very high quality wood in my work, but in this case, I wanted the texture of the wood to be a prominent part of the print. I found a few discarded pieces of wood that were perfect for the project. I cut them down on the table saw, transferred my image in reverse and carved. Drying. The sea is on the left, the pour is on the right. Whenever I mix processes (in this case woodtype and cuts with woodblocks) I build in plenty of extra paper for proofing. The only way I can see if the color is working and the registration is correct is to pull a proof. The end results of the make-ready are always interesting, even though they are "wrong". I often have a hard time recycling them when I am done...so I always hold onto a few of the most unique proofs. Space 1026 has coined the perfect word for these prints: Super Rare. Blue, my favorite color. It always has been. The t,c, and h: in lock up. 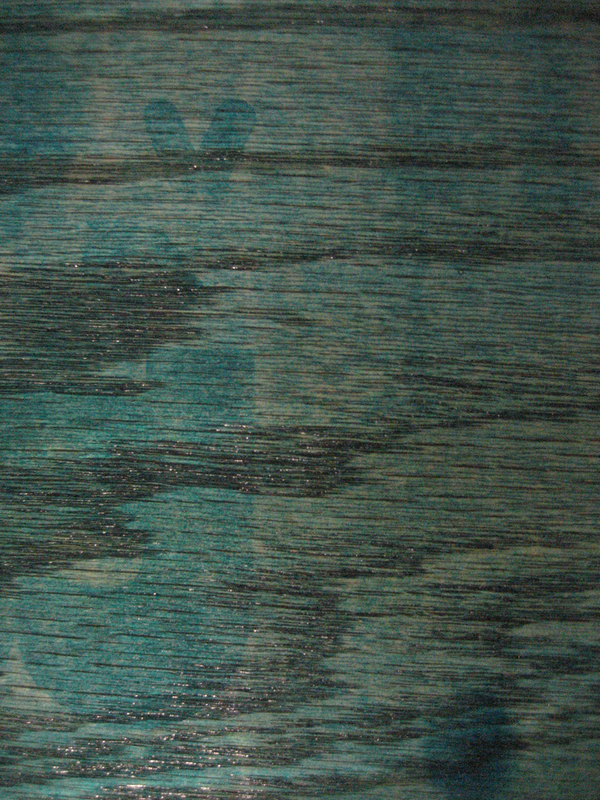 I used the grain of this low-grade plywood a foundation texture for the print. 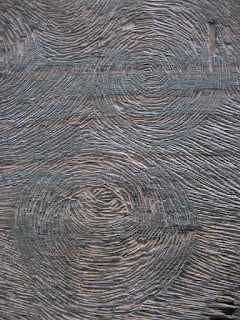 Reduction carving created a new layer of texture (and gave me a blister). 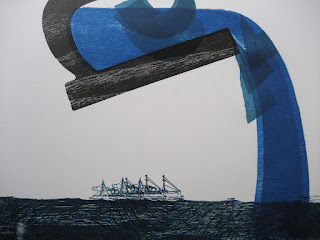 Detail of the sea, created with the many layers described: type, broken type, plywood and carved wood. 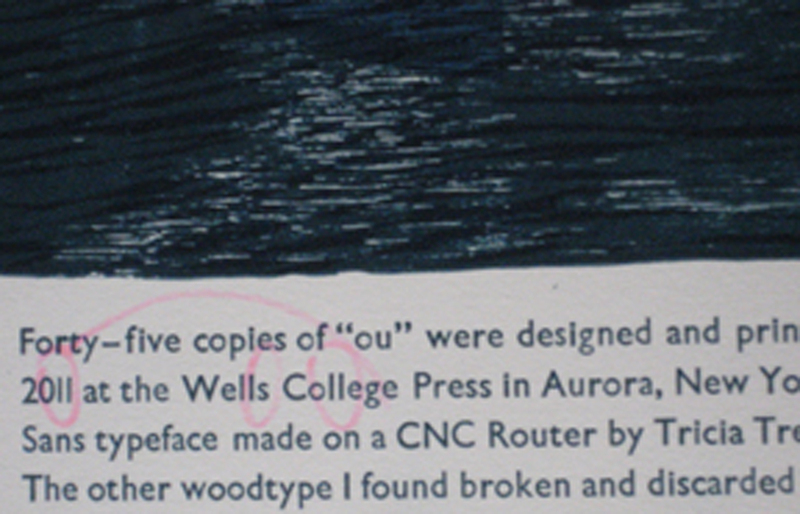 Proof reading and fixing errors in the colophon. The "1" and "l" of Gills Sans are remarkably similar. I have participated in many exchanges over the years, and it always reminds me of the comforts of school--where someone else sets the parameters and gives you the assignment (deadline included). 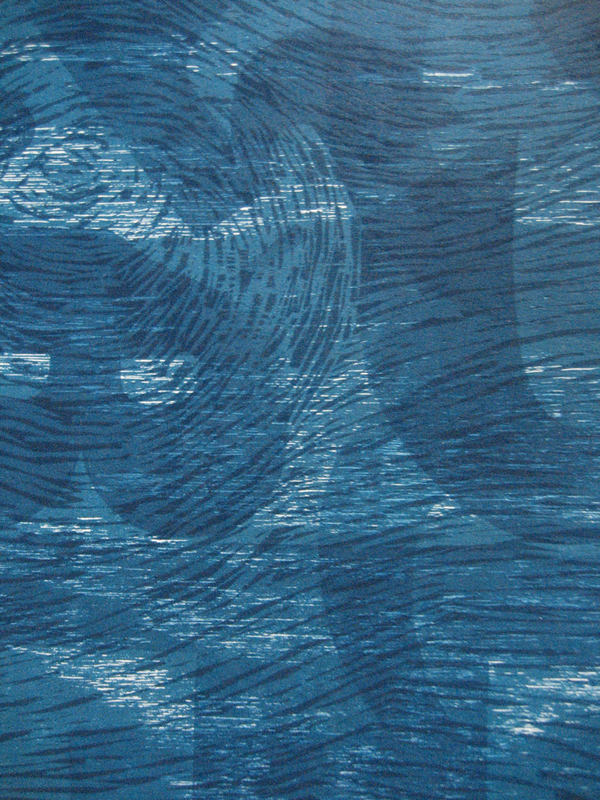 I was particularly pleased with the results of this print. In the end I have a piece that really feels like my work, but I am sure I would have never arrived at this piece, had Tricia and Ashley not handed me the materials. It is also very interesting to see the variety of work that the other participating artists produced, despite the fact that were were working within the same parameters. 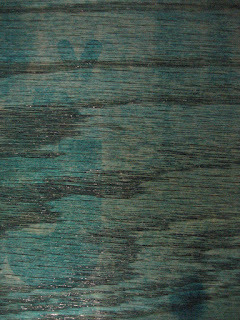 You can see the final prints from the exchange and read about the process at www.vswtp.org.